Recently, a posting at the Dave Schutz - Superman Friendly Discussion Board drew my attention regarding the phrase, "Mad About the Boy." used in the film Hollywoodland. It was Louise Blyton who wondered if this phrase was actually inscribed on a watch owned by George Reeves. When I first saw the film on September 8, 2006, I instantly recognized the phrase as that coming from a late 1980's Phyllis Coates interview. It was Gypsy who describe the comment as being made by Toni Mannix about George Reeves during their split. Toni would say to Gypsy that she was "absolutely mad about the boy." 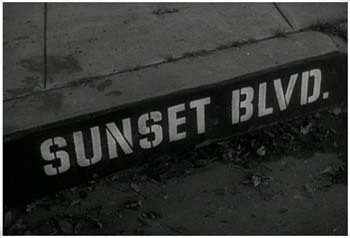 When the discussion on the board continued it was to my complete surprise this comment originated from the film Sunset Boulevard (released in 1950). At the time I'd never seen the film and therefore never made the connection. Serena Enger also noted a predated song by the same phrase; "The song, 'Mad about the Boy,' by Noel Coward seems to reflect Toni's and George's love of the cabaret / supper club nightlife where this song is a staple of singers, like Jeri Southern's 1958 version. Louise would strongly recommend to me to see the film, since other similarities between George and Toni ring too familiar with Sunset Boulevard. Thanks to Dave Orbach who loaned me his DVD, I had the pleasure to view this masterpiece.
" Two years ago we wanted to do a story about Hollywood. Someone suggested a relationship between a silent-day queen and a young man. She lives in the past, refuses to believe her days as a star are gone, and has sealed herself in one of those rundown, immense old mansions on Sunset Boulevard, amid a clutter of mementoes like the Lewis XV commode and the huge gondola-shaped bed in her bedroom. We see the screen writer as a nice guy, maybe from the middle West, who can't make the grade in Hollywood and is really down on his luck. In a revelance, "suppose the old dame shoots the boy." This taut, pathetically grotesque woman, this manic-depressive driven to murder when her dream of love, her dream of success, the whole fabric of her life are shattered. To him she is a temporary haven, a meal ticket. It's a pity that keeps him around the place." 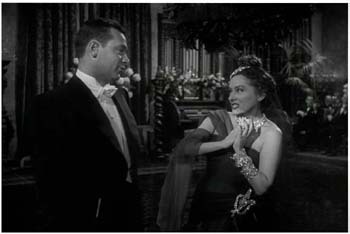 In another New York Times article dated August 11, 1950, titled, The Screen: Inner Workings of Filmdom, Joe Gillis, the script writer played by William Holden is described as "a struggling , disillusioned writer who grabs an opportunity to make some money by helping Norma Desmond fashion a screen play about "Salome" with which the hopeless egomaniac believes she will make a "return to the millions of people who have never forgiven me for deserting the screen." Joe Gillis is indignant when Norma insist that he live in her house, but gradually his self respect is corroded by easy comforts and he does nothing strenuous to thwart her unsubtle romantic blandishments. Before an attachment to a girl of his own age jolts him out of his dark abyss and rekindles his writing spark, Joe has become hopelessly entangled in the life of this psychopathic star who holds him down with lavish gifts and an attempted suicide." 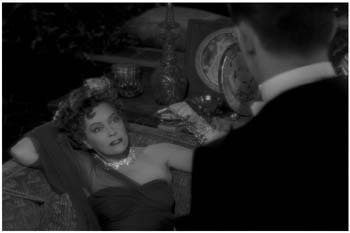 In truth, before my recent viewing of Sunset Boulevard, my only reason for wanting to see the film was due to the comparisons often noted in various essays between Madame Selena Dawn of Mystery in Wax, played by Myra McKinney and Norma Desmond. It would be their crazed and emotional expressions made in desperation that have many to suggest McKinney was performing much like Swanson did as Desmond. For this reason, while wanting to see the comparisons, I felt no urgency to see this film. How wrong I was to ignore this brilliant masterpiece up to now. First and foremost, I was completely captivated by its characterizations performed by the cast members, mostly for Gloria Swanson's performance as Norma Desmond is tremendous. Learning more about the casting, I read Gloria Swanson's character is superficially similar to herself, thus making her a well placed choice for the role. At the time she was out of the public eye and making a come back. Others like Mary Pickford, one of Paramount's first big female stars and Mae West, an icon in her own right were initial choices. Both were dropped for specific reasons. Swanson's well rounded performance included creepy facial expressions, which conveyed the complexity of her most inner emotions. When Joe asked her if she is planning a "comeback," she immediately scolds him by saying, "I hate that word!!" Her emotions throughout the film runs in all directions in rapid-fire succession. She would change with almost every sentence, almost with each syllable. Norma was filled with all the denial to accept the truth that her life as an actress was no longer of much interest to the public and foremost the studio. She yearned to "return" to her adoring fans, but only a call from Cecil B. DeMille himself would be good enough to do so. Norma lived in her own world, surrounded by photographs of her silent film career. She would also entertain herself with films shown on a screen in her living room. Her viewing of films consisted of those only featuring the glorious "Norma Desmond." The film opens with a police motorcade of motorcycles and squad cars traveling on down Sunset Boulevard in an urgent manner. They soon turn off the boulevard and come to a stop in front of a mansion. There they race to the swimming pool where a body is floating face down. 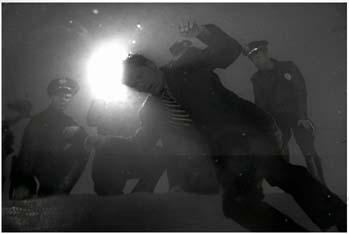 From below the camera angle reveals the corpse of Joe Gillis, played by William Holden. At this point, the story transforms into a flashback, narrated by the dead man. Joe is described as a scriptwriter, living in an apartment. If you're watching the film with George Reeves and his relationship with Toni Mannix in mind, there are numberous similarities throughout that cannot be avoided. 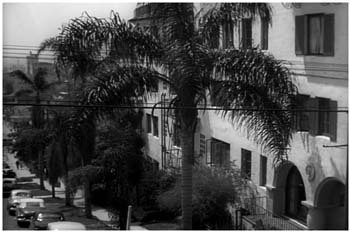 Before George moved to 1579 Benedict Canyon Drive, he lived in an apartment on Devon Street. Making a comparison between George and Joe because they both lived in an apartment is truthfully making something more of an issue than it should. 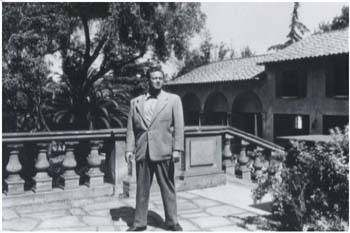 In reality, there are a lot of apartment buildings in Los Angeles and those young in 1950, with ambitions of having a career in the entertainment field, such as Joe Gillis (screenwriter) and George Reeves (actor) more than likely lived in apartments. Joe, lacking the necessary funds and in dire need to save his car from being repossessed by two men hired to take back the vehicle due to lack of payments. Desparate for money, Joe finds his agent on a golf course. Joe and his agent engage in a small disagreement about the amount of attention he gives to his work and as a result the agent refuses to loan Joe money. Soon afterward, Joe is spotted on the road by the two men and a chase ensues on the actual Sunset Boulevard. 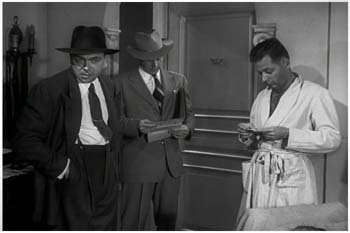 One of the men is played by Larry Blake (see image above), known to TAoS fans as Steve Martin in Jet Ace, The Secret of Superman and also Blue Gardenia with George Reeves and Robert Shayne. During the chase, Joe turns off the boulevard giving the men "the slip." He turned into a long driveway with an old, run down garage. Inside the dusty garage resides a vintage 20's touring mobile in the grandest style. The automobile is a foreign built Isotta-Fraschini. 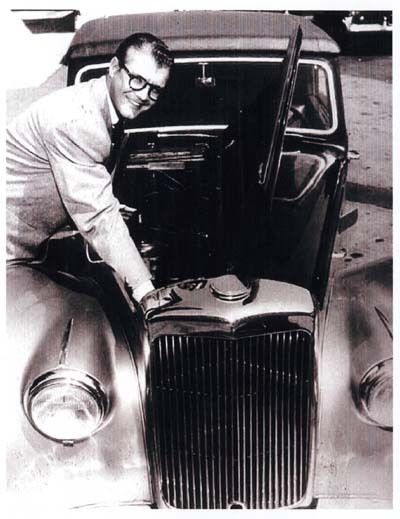 At first glance I thought this was the classic Musters Koach before Mr. George Barris got hold of it. For now, the car has no specific meaning. 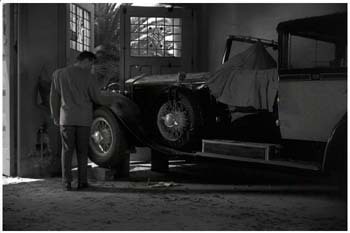 It didn't slip my notice it bore a similarity to George's 1953 Alvis. After hiding his car away, Joe looks up from the garage to see an old but magnificent mansion with an empty pool along side it. Joe gazes at the large mansion he decribes as a "large white elephant." Soon, he hears the voice of a woman. Turning towards the voice he sees a woman standing afar and behind an outdoor screen. With her dark sunglasses, her appearance is eerie and I couldn't help but think of George's mother, Helen Bessolo. 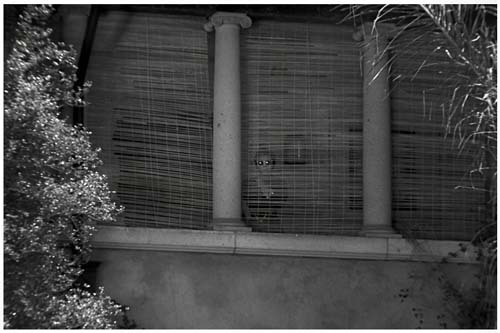 In Speeding Bullet: The Life and Bizzare Death of George Reeves by Jan Alan Henderson, it is written George while standing in his backyard was startled by an entrance Toni made during an unexpected visit. Looking into the house where Toni stood, George mistook her for his mother. Always appeasing Norma's state of mind was her devoted servent Max Von Mayerling, played by Eric Von Stroheim. He yielded to her every wish. His sole purpose in life was to care and protect Norma from the public and of the truth that she is forgotten by the outside world. Max revealed to Joe that Norma would also need protection from herself. Mr. Von Stroheim is a notable director, having directed Gloria Swanson in the 1929 film Queen Kelly. Unfortunately, Von Stroheim's directing career was in trouble beginning with the 1924 film Greed. The special features of this DVD includes a "Making of Sunset Boulevard: A Look Back." Within, it is revealed Swanson had a dislike for her Queen Kelly director. Because of the difficulties, she placed a call to the films financer, Mr. Joseph Kennedy. The segment states Swanson and Kennedy were lovers at the time. According to the segment Swanson exclaimed to Mr. Kennedy, "Joe, come down here. We have a madman directing this picture." Mid-point during filming, she received a phone call and walked off the set and didn't return. Interesting to note, it's a scene from Queen Kelly Norma is exhibiting to Joe in her living room thanks to a hide-a-way screen revealed from behind a large painting of...who else? Norma Desmond of course. A nice home entertainment feature for any time period. 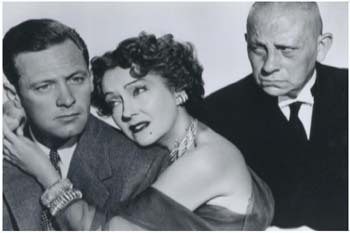 It would be in 1949, at the start of filming Sunset Boulevard, Swanson and Von Stroheim would be reunited and whatever rancor they had for each other was no longer. Both would see each other for their best qualities, instead of their worse. The character Max devoted his life to taking care of Norma. But his years of devotion didn't begin as her servent. As a show of disapproval with the lifestyle Norman and Joe have together, Max is often frowning at Joe. He seemed to do so even during those scenes which they appear to be getting along. Max remains restrained throughout in order to allow his love the happiness and dream fulfillment she craves for. Max tells Joe there were other men before him, but they didn't last. I would wonder if there was something sinister to their mysterious departure. No explanation is ever given. However, it doesn't take long to figure out Norma is not normal and most likely their reasons for leaving had a lot to do with her fortune not being worth staying for. This would be a stark contrast to Joe Gillis, who while bitter at himself for staying, develops a genuine concern for her well being. He is overwhelmed at the news of her attempt of suicide due to the argument the two had earlier that night.. Having walked out on Norma and attending a joyous New Year's Eve party, with an abundance of beautiful and available young woman (one played by Yvette Vickers of Attack of the 50 Foot Woman fame) for his picking, he rushes to Norma's side. As for Max, he is again having to wait for another man to leave Norma before having her all to himself. In a story twist, we learn Max was Norma's first of three husbands. We also learn he was once a respectable Hollywood director and would now do anything not to upset or destroy Norma's state of mind. To ensure her safety from moments of meloncholy, he must keep anything remotely dangerous away from her reach. For her own safety, all the knobs and locks are removed from all the doors in the house. It would be the doctor's orders that Norma not be able to lock herself away during a serious episode of depression. This certainly could lead to her committing suicide. Whatever Norma wanted, Max made sure she was never without. Perhaps a comparison could be made between Eddie Mannix and Max. Like Max's relationship with Norma, Eddie would have to accept Toni's secondary relationships. Eddie cared for Toni, giving her everything she wanted. Toni was the "girl with the million dollar legs," a one time Ziegfeld Follies dancer and Eddie would never see her unhappy. Joe's car is eventually found by the two finance men. At which time, a desperate Joe seeks immediate help from Norma for money. Like the agent earlier in the film, she denies him the needed cash to save his only possession. Norma shrugs off the car and states to Joe his car is not important since she has a car in the garage they can use at anytime. The very same dusty, old car that hasn't been driven since 1932. All he can do is watch his car being towed away. Interesting to note is, aside from the Madam Selena and Norma characters, there is also another reference the narrator (Joe) makes which immediately makes Mystery in Wax come to mind. There is a scene involving a card game with Norma Desmond and other out-of-work silent screen performers. No longer in show business because they don't fit in with the new generation of "talkies." Joe refers to these actor-friends as Norma's "Wax Works." The "girl" referred to in the above NYTimes article dated August 11, 1950 is character Bette Schaefer, played by Nancy Olson. It states, "a girl of his own age jolts him out of his dark abyss and rekindles his writing spark." At first, one might think a comparison could be made of a Leonore Lemmon jolting George from the grips of Toni, as well as motivating him to alter his career. With directing three episodes of TV's Superman, George already had ambitions to produce and direct two films, Return to Earth and The Deserter. 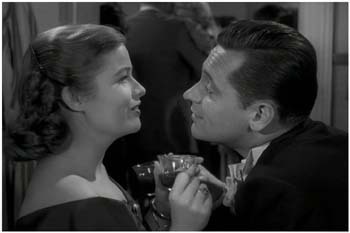 While these were positive goals for George, Leonore's character and reputation is a far distant from that of a Bette Scheafer. In addition, if she pushed George to work it was because she realized he had far less money than she thought before coming to Los Angeles. In her own words, Nancy Olson was described in her high school as "Wholesome Olson." Her "girl next door" looks were the prime reason she was called upon to play Bette Schaefer. Bette Scheafer and Nancy Olson are synonymous. The film makes numerous suggestions that Joe Gillis is penniless. A comparison could be made that George suffered similar financial challenges at the time he met Toni Mannix. The burden of two actors making a living is one known reason George's wife, Ellanora Needles sought to divorce him. To some degree, a comparison could be made between Ellanora and that of Nancy Olson's Bette Schaefer. Both Joe and Bette would work together to develop a movie script and George and Ellanora worked together in a Hopalong Cassidy film and most notable in 1943's Winged Victory. During this time they were full of zest for each other. A more similarity between Joe & Bette and George & Ellanora is both woman had dreams of wanting to start a family. Joe knew he was in the way of Bette succeeding with this ambition. George and Ellanora's departure from each other would allow her to have the family life she desired. The timing of course differs from each other. Joe sends Bette off at the end of his relationship with Norma. George and Ellanora ended their marriage before Toni entered George's life. Ultimately the outcome is the same. The relationship between Joe and Norma would have it's continuous ups and downs, often enhanced by Norma's strong will to keep Joe nearby at all times. She lavishes him with expenses coats, suites and other clothing and expensive jewelry. If this sounds strangely familiar, you're not alone in thinking so. Toni often clothed George and provided expensive gifts for him. Including expensive automobiles such as a Jaguar and an Alvis. Whether or not he liked it, Joe has become a "kept man." He is so trapped by Norma he has to sneak off at night to work on a movie script with Bette. Interesting to note is a subtle suggestion made when Bette asks Joe where he has been keeping himself. Looking downward, his response is, "I haven't been keeping myself at all." His meaning is obvious. Less a comparison and more of an observation, George gives an equal performance in the 1951 season episode, The Stolen Costume, when telling Candy something very important was taken from him. Both for the moment have lost their freedom and a little bit of who they really are. On the night of New Year's Eve, Joe is dressed in a tuxedo and looking forward to a house full of guest. Most likely expecting to rub elbows with important Hollywood people. He soon finds the party is attended by no more than the host, the servent, a four piece musical band and himself. Aside from being disappointed, he finds this very strange behavior. Norma on the other hand is happy and exhilarated. She fawns over him. Norma: Perfect shoulders. I love the lines. Joe: It's all padding. Don't let it fool you. To me, getting dressed up was always just putting on my dark blue suit. Norma and Joe have an argument over this strange situation. She runs up to her room, obviously disappointed the night did not go as she'd hoped and planned. But even without Norma's immediate presence, she seems always present. As he quickly exits, the door catches the chain of his pocket watch. It is as if Norma herself were reaching out to keep him from leaving the house and her. Later in the film Norma finds out about the late night liaisons. As a result, she is enrage with jealousy. 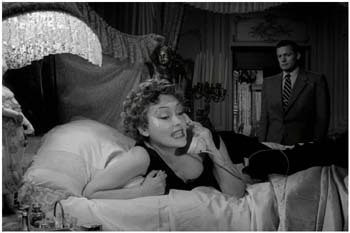 Norma harasses Bette over the phone, leading Joe to immediately take action and reveal his true self to Bette. 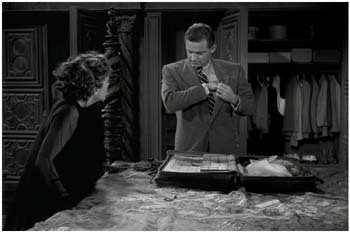 Upon her arrival to the Desmond mansion, Joe shows Bette the life he has been leading. At first, it appears the message is he couldn't leave the lavish lifestyle Norma has given him for just a simple girl trying to make it in Hollywood. He does his best to make sure she understands the opportunity he took to jump ahead and how selfish he has been to stay because of it. A contrast to hard working people like her. The "Joe" she believes to know is a facade. A fake. 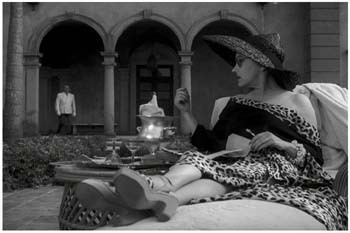 Spoiled by everything Norma Desmond represents. Take Norma away and Joe by his own merit is no further ahead in the business than he was when he first met Norma six months earlier. Regardless, Bette is in love with Joe and she begs him to leave with her. Engrained is the image of Joe being a real successful writer and the life together will be wonderful. Most men would have consented. But Joe's last remaining self dignity knows to do so would be most unfair to Bette. He messed up his life and in a noble gesture refuses to allow the same for Bette. He represents her turning point in life. He insists she return to Artie, who is everything he is not. For Bette's sake, she deserves the promising and innocent life that Artie brings to her, instead of a life with a corrupted loser. Artie, a decent, hard working guy, deserves Bette. Bette is heart broken as she leaves, and perhaps having not yet fully understood what just took place. Joe loves Bette, which is why he must put her before himself. 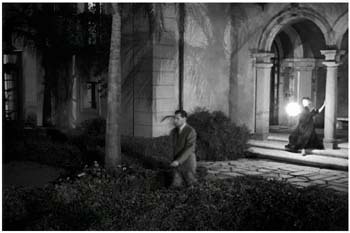 Interesting to note is as Joe is showing Bette the door, he turns a light switch on to illuminate the swimming pool. He says to her if she and Artie ever happen to see the pool light on, they are welcome anytime to come over for a swim. I couldn't help but think about how the outside light played a small role on the night of June 16 1959. With Bette now gone, he immediately packs his bags, leaving behind the closet full of fine clothes and expensive items Norma provided for him during their turbulent time together. He knew from the beginning it was wrong to take gifts from Norma. Often did he plead with her not to give the gifts, but always to no avail. So he went along. It all began with a hustle to rewite Norma's script Salome. It was a mistake to take her gifts as compensation. For his own sake, he must make things right by moving on. As is, he could never lead the normal life, the kind if he had worked hard like Artie. The reward would have been to meet someone like Bette. 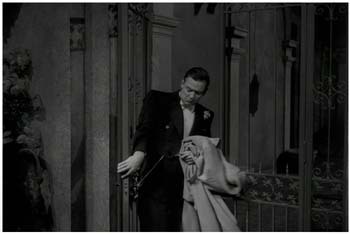 Nearing the film's climax, Joe is packed and leaving Norma. He's done, finished with her constant control over him and the bizarre behavior she exhibited throughout their time together. A crazed and desperate Norma follows him outside with a revolver. She aims and fires. The first shot hits Joe from behind. He is jolted, but continues onward as if ignoring her. The second shot spins him around, followed by the third, which plunges him into the lighted swimming pool. All bullets reached their target. Interesting to note is the newspaper articles of the time state three bullet holes were found in George's bedroom. Two in the floor, plus the fatal bullet lodged in the wall-ceiling. Beyond the official media reporting, it is known additional holes existed. The feature above titled Mad About the Boy is the copyright and ownership of Lou Koza and cannot be reproduced by any means, in whole or in part without Mr. Koza's written permission.